Cook the chicken pieces with 4 cups of water adding little pepper powder and salt. Shred the chicken pieces and keep it aside. 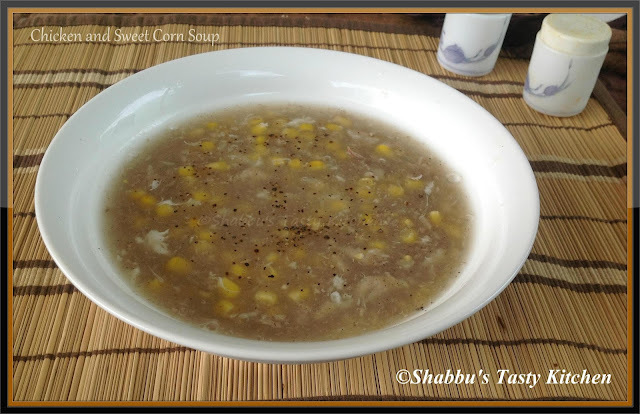 In a pan, add the chicken stock and sweet corn and bring it to a boil. Mix cornflour with 1/4 cup water and add to the boiling soup stirring continuously. Reduce the flame and add the shredded chicken pieces and cook for 2-3 minutes. When the soup reaches the required consistency, slowly add the beaten egg white and keep stirring continuously until it forms like fine threads ( or pour the egg white slowly through the strainer).